Discussion in 'Online Games - News and Reviews' started by Marina, Oct 13, 2014. Enjoy a fun and thrilling vampire themed video slot from RTG (Real Time Gaming). Count Spectacular, as the name suggests is based upon one of the most notorious vampires in history; Count Dracula. players to win some real cash and get a thrill of excitement as the Count expands to multiply your winnings. There's a bit of mishievous with our characters. Even the Count has an odd twinkle to his eye. hit after your spin. 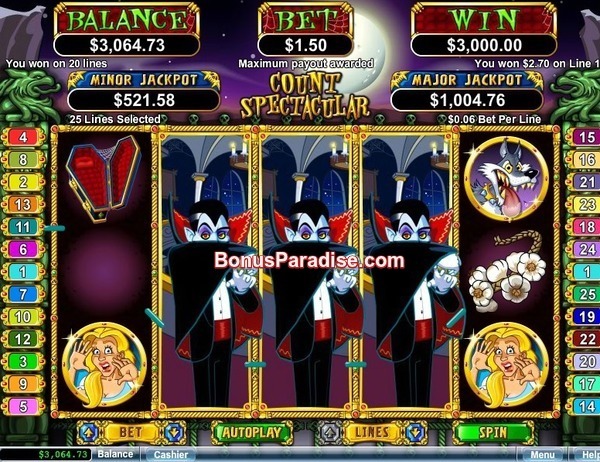 Transpose yourself back to Transylvania and join the Count to some great winnings and a potential Jackpot playing one of the favorite Real Series video slots. Players will love spinning the reels of Count Spectacular that has 25 paylines, across 5 reels and 3 blood shattering lines. You can determine the size of your bet for as little as .01 per line and up. two different bonus features. The player makes the choice. Free spins or re-spins? as a Scatter. When he appears on a reel, he expands on that reel and makes that reel wild. It is possible to receive a Count on each of the reels. That would be the ultimate winning combination. More about our expanding Count to come. Symbols include: Count Spectacular, Scatter Castle, Blonde haired girl, Creature Assistant, Werewolf, Open Casket, Bat, Carriage, Garlic, Mirror and Lantern. When our wild Count Spectacular simultaneously appears on reels 1 and 5, the feature will begin. Players will have their choice of chosen 12 free spins at 3x's the winnings or 4 re-spins with the current spin. If you have a winning combination of significance when the feature is triggered, it would be worth your while to go for the re-spins. Should you choose the 12 free spins, the free spins could be re-activated should the Count again appear on reels 1 and 5. Watch as he expands to bring triple the winnings during the feature. Fill your coffin with riches. This RTG video slot isn't only for Halloween. It's one fantastic RTG to be played all year long to bring in some incredible breathtaking wins. Is it true vampires do not see their image in a mirror? Come play Count Spectacular at iNetBet Casino and find out. You'll never be bitten like this again. This has got to be one of my favorite Real Series video slots. I love seeing the Count expand on my screen. I really love this Video Slot!